Map showing country wealth, 2010 – courtsey of IMF. Many countries fight for one thing – global supremacy. One of the most important weapons for achieving supremacy is economic wealth. N.B.GDP Note: GDP is in nominal prices, and therefore not comparable across time. Did Paul Krugman get it wrong? Paul Krugman, the winner of the 2008 Nobel prize of Economics has been a professor of Economics and International Affairs at several Universities in the USA, and a columnist for New York Times. He is sometimes not only controversial, but overly patriotic. Krugman’s sentence effectively dismissed any possibility of Eastern economies ever catching-up in economic wealth with the Western democratic economies, particularly his own country, the USA. One argument he put forward was that empirical analysis strongly suggested that the high economic growth rates of the ‘Tiger Economies’ (the name used for the first industrialising East Asian economies in the 1960s and 1970s) were almost entirely driven by capital accumulation. He emphasised that once capital accumulation was accounted for, there was no room left for the contribution of technological progress to the economic growth of those economies. He asserted that economic growth that is based on expansion of inputs, rather than on growth in output per unit of input (productivity), is inevitably subject to diminishing returns. Therefore, since the USA’s economy is almost entirely driven by technological progress (productivity), the Tiger economies would suffer labour and capital accumulation diminishing returns, which would render them incapable of catching-up with, let alone overtaking the USA’s economic wealth. At only 59 years old, Krugman could live to eat his own words. As the trends in the above table demonstrate, if good health is on his side and he lives to an age of at least 90 years – i.e. at least 30 years from today, the economic evidence at that time could prove how naive and wrong he was. His ‘generous’ statements in his article could easily undo all the good he has done – history could judge him as the Nobel prize winner who got it wrong. Is the Nobel prize winner admitting he got it wrong (listen to 21st second of recording)? An economic growth of a country is a measure of a relative change in its total wealth over one or more time periods. There are several factors that contribute to the economic wealth and consequently economic growth of any country. These include for example, labour, capital (investment in capital assets such as machinery, industries, schools, hospitals, infrastructure including roads, railways, airports and telecommunication, etc), natural resources, international trade, human capital development, innovation, good governance, international aid, etc. The percentage contribution of each of the above growth enhancing factors over a given historical period of time can be estimated using a methodology called ‘growth accounting’. But there are problems associated with capturing and storing data for the above economic growth drivers. Some problems arise from the logistics at the micro-level, while others result from the volume of data involved. In addition, some of the economic growth drivers cannot be quantified. Economists have therefore used simplistic models in order to overcome the data caveats. The empirical evidence which Krugman makes reference to uses a simple model in which growth is driven by two quantified factors, labour and capital. Labour is measured as the annual wage (salary) bill of the employed people, while capital is measured as the capital stock equivalent in monetary value. All the remaining growth drivers are treated as an unexplained residual and given the name ‘technical progress’ – i.e. whatever is unexplained by the model is technical progress. For example, if the analysis shows that labour contributed 40% and capital accounted for 50% of economic growth, then the remaining unexplained 10% is by induction attributed to technical progress. Product innovation, which involves the development of new more efficient and productive machinery. Process innovation, which engenders the development of new ways of performing tasks more efficiently. Empirical evidence from the growth accounting approach suggested capital was responsible for a significantly large percentage of the growth of the Asian Tiger economies, followed by labour, leaving a very small percentage (often less than 10%) of the unexplained ‘technical progress’. Results for the USA showed capital and labour contributing a small percentage, leaving a significantly large percentage unexplained ‘technical progress’. Does the source of economic growth matter? Growth is ‘growth’. Does what drives it matter? Take two people at a micro-individual-level. Both of them are millionaires. One owns a very large dirty farm, and the other owns a very clean car industry. Is the car industry owner a ‘better’ millionaire? Now, apply the above concept at a country level. The fastest economic growth route for any country is through exploitation of its factor products – taking advantage of the most efficient/abundant resources relative to their economic development stages. Putting economic/financial downturns/crises aside, the developed countries, particularly the USA have taken advantage of their labour and capital accumulation to almost saturation levels. Under normal circumstances, the unemployed now comprise people who find it more economical to rely on the welfare state, or who won’t bother to work. They have also already made significant capital investment to levels where additional investment is more of renewal/replacement, and less of completely new standalone investment. The developed countries are therefore left with only one factor to fall back to – innovation. They have no choice! If they don’t innovate, they are doomed and won’t grow economically, because they will loose competitiveness. The newly industrialising countries, including Krugmans’ Paper Tigers on the other hand have both choice and potential at their disposal. They still have large ‘armies’ of the unemployed, whom they can utilise in the labour intensive production. They are also still in the industrialisation development stage. That is why they both need and still have potential for capital investment. There is no need for them to leapfrog into innovation, when there is still potential for them to mobilise and exploit their current factor endowments. For now, they can still grow economically with or without innovation – there is no urgent need for innovation, at least not the latest innovation! Innovation in its fully blossomed stage is therefore their spare master card for the future – to be explored once labour and capital accumulation diminishing returns have fully set in. In fact, the industrialising economies’ potential/fortune keeps increasing with time. For example, the diffusion of both product and process technology is becoming increasingly simpler and faster, courtsey of globalisation! Furthermore, when the time for innovation comes, the industrialising countries need not necessarily require the most up-to-date technology, and need not innovate by themselves – they just have to copy what already exists! Economic growth in itself is a development process, therefore what might appear outdated technology by the developed countries, can be embraced as new technology for the industrialising countries, with its full potential to enhance the economic growth process. Having exploited the potential of their agricultural and industrial sectors, developed countries are now mostly dependant on the services sector for their economic growths. But services is a ‘bubble’ sector, which is heavily influenced by externalities. Recent financial crises have exposed its vulnerability to certain innovation tools, particularly the speculation in the stock market and the financial tools and products in the banking industry. In fact, the developed economies are now (January 2012) on a verge of economic recession, because of their over-reliance on innovation in the services sector. As if that isn’t enough, some industrialising countries have another spare master card – population size. It is evident from the above table that there is a high correlation between economic wealth and population size – clear evidence that size matters. Eight of the most populous countries are among the World Bank’s projected 12 richest in 2050. The exceptions for obvious reasons are Pakistan, Bangladesh, Mexico and the Philippines. With large population sizes, they don’t have to achieve the high per capita incomes of the current economic powers in order to become economic powers themselves – their per capita incomes don’t have to converge with those for the current developed countries. They only require a fraction of it! For example, the World Bank database for July 2011 reports the 2010 per capita income for USA to be $47,140 and that for China as $4,260. An average American is 11 times richer than an average Chinese. However, because China’s population is more than four times that of the USA (and still growing), it requires its per income to be just one quarter (around $12,000) of the USA for its economic wealth to catch-up with the USA. To put this into perspective, China’s target is to achieve a per capita income equivalent to for example the current (2010) per capita incomes of Libya, Poland, Hungary, Latvia or Venezuela . Although this target is threefold its current per capita income, it isn’t an impossible target to achieve in 30 years! 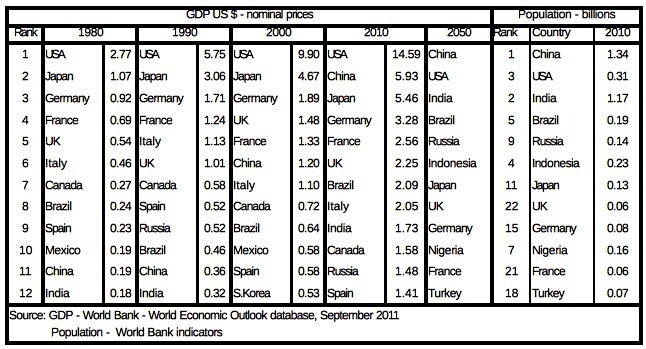 Remember, China has managed to move from 11th place in 1980 to the second richest economy in 2010 – i.e. after 30 years. During this period, its wealth has overtaken that of 7 developed democratic economies. It is now left with just one target, the USA. Krugman, watch this space if you are still alive in 30 years’ time. It is no longer a question of IF it will happen – it is an issue of WHEN it will happen! Krugman, P., The Myth of Asia’s Miracle, Foreign Affairs, Nov/Dec 1994, Vol 73, Issue 6, pp. 62-78.